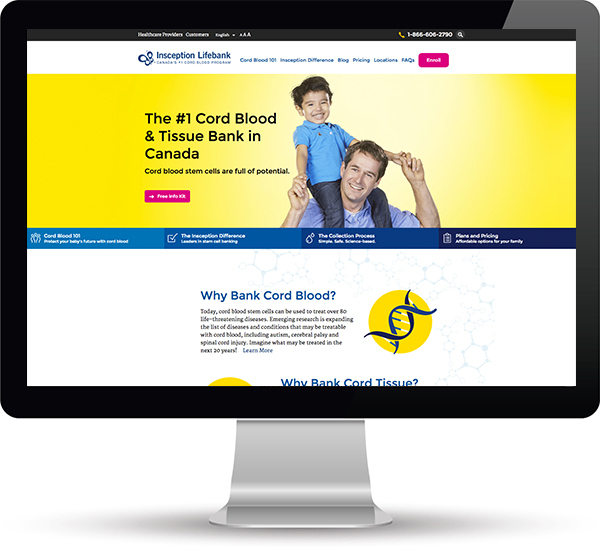 Founded in 1996, Insception Lifebank is Canada’s first, largest and most experienced cord blood program, with more releases than all Canadian cord blood banks combined. With a fierce passion for quality and the highest level of voluntary accreditation, (AABB and FACT), Insception Lifebank is the #1 choice of Canadian parents with over 65,000 cord blood units stored. We delivered a “full stack” marketing and technology solution. This included the writing, design, and development of a new SEO-optimized (and AODA compliant) website. We also implemented a sophisticated marketing automation system that integrated leads from real world events, the web, email campaigns, and social media, along with a reporting dashboard. We have also designed a number of collateral pieces, including an infographic detailing the cord blood collection process. In addition, we fully managed the clients PPC spend, ongoing SEO, and Social Media community management activities. Finally, to improve client service (and reduce client service costs) we have also developed/integrated a self-service portal for Insception clients. The new website and associated marketing activities have increased Insception’s profile, and sales. The look and feel is more in line with their real-world brand, and despite the increasingly competitive market, the client stands out. The marketing automation system provides complete tracking for every prospect, no matter the channel – and for the first time ever, Insception has significant data on which to base future marketing decisions.